The volume of data on mobile networks in Ireland has increased by over 75% in the past year, while texting (SMS) has decreased by almost 20% in the same period according to the latest Quarterly Report by the Commission for Communications Regulation (ComReg). The Quarterly Report on the Electronic Communications market for the period (1 July to 30 September) Q3 2014 is available to download from the ComReg website. See below for an infographic. Fixed Broadband subscriptions increased by 1.2% on the previous quarter with a 6.9% annual growth and stood at 1.24 million broadband subscriptions at the end of September. The estimated household (fixed and mobile) broadband penetration rate at the end of Q3 was 67%. The number of fixed phone subscriptions has increased by 4.8% since Q3 2013 to reach 1.58 million. Average broadband speeds continue to increase. In Q3 2014 43.2% of all broadband subscriptions were equal or greater than 30 Mbps up from 32.5% in Q3 2013 and approximately 61.8% of all broadband subscriptions were equal to or greater than 10 Mbps, up from 42.1% in Q3 2013. Fixed voice traffic has declined while mobile voice traffic has increased this quarter. Fixed voice traffic has declined by 7.1% while mobile traffic increased by 2.3% compared to the same quarter last year. 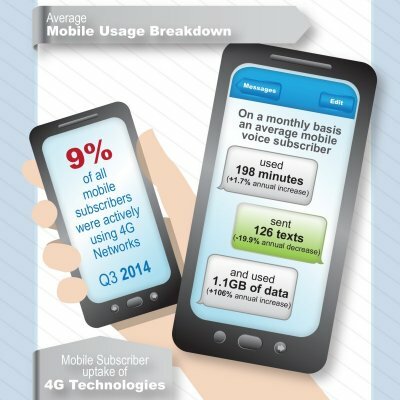 The total number of text messages sent by mobile users in Ireland was over 1.83 billion in Q3 2014, down 19.5% on Q3 2013. The number of multimedia messages (MMS) sent was down 1.0% compared to Q3 2013, although MMS numbers grew slightly in this quarter. In Q3 2014 9% of all mobile subscribers have actively used 4G mobile networks and data volumes continue to rise, increasing by 75.7% in the year to Q3 2014 to reach 18,476 terabytes. In Q3 2014 mobile Average Revenue Per User (ARPU) was €25.4 per month, up from €24.9 per month in the previous quarter, but still slightly below the ARPU of €25.8 per month in the period Q3 2012. This overall decline over this period is in line with a general downward trend in ARPU across Western European countries. There were 5,759,563 mobile phone subscriptions at the end of September which was an increase of 0.2% on the previous quarter. Ireland’s mobile penetration rate for the quarter was 124.9%.